The Baron Pierre de Coubertin, founder of the modern Olympic Games famously commented that the Olympic Spirit was not about the winning but rather the taking part. This was certainly a noble comment from a noble man. But throughout their history the performance of national teams has become a way for nations to send a message to the international community or assert their economical or military might. Ever since the Berlin Olympics in 1936, the games have become intertwined with politics and ideology. The Nazis determined to prove the superiority of the Aryan race were stunned by the dazzling performance of Jesse Owen and the black members of the US Athletic team. From the 1950s the Soviet block turned its gymnasiums into Olympic medal factories, as the cold war turned steamy in the stadiums. With the communists crumbling, the Americans felt that their new status of only superpower in a unipolar world should be reflected in the medals table. 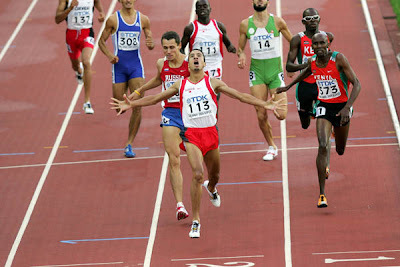 This was short-lived and the quiet display of Chinese financial, organisational and presentational skills in the run-up to the 2008 Beijing Olympics was an omen of the emergence of a new sporting superpower. In the final analysis that same socio-economic context cannot be solely responsible for the poor performance at the Olympics and other Sporting competitions when countries like Jamaica, Cuba and Mongolia outperform Saudi Arabia, the United Arab Emirates and Libya. We have to come to terms with an underlying malaise running within Arab society, a lack of self belief and what can only be described as an ‘eternal loser’ mentality. The state, viewed mostly as an apparatus of oppression does not view sport as a priority. Nonetheless, small practical measures can be implemented at reasonable costs. Individual countries need to focus on sports at which their citizen traditionally excelled, while a broader strategic plan is required at the regional Arab level to improve the general quality of competition. And for once we cannot blame the Israelis for our misery. They managed a unique Bronze Medal in Sailing. An Arab sporting ‘Nahda’ is required before 2012. Is there a Sport Psychologist in the house?